U.S. commercial fishermen aren’t fishing for themselves, they are fishing for the 300 million or so consumers in this country who want a diet that includes wholesome, high quality and, if possible, locally produced seafood as soon after it is caught as possible. The American Sportfishing Association is a trade organization that represents businesses that provide goods and services to recreational anglers. All conservation rhetoric aside, it’s members do better if there are more recreational anglers who are fishing more, and it’s no secret that getting more anglers fishing more is most easily accomplished if they are allowed to catch more fish. The more fish that are allocated to recreational anglers, the less fish will be available to the non-fishing public. The rise in the consumption of cultured tilapia, cultured swai and cul-tured shrimp of questionable origin and questionable quality is due to two factors: per capita seafood consumption in the US has been tending upwards for years, and commercial landings of many of the most popular fish and shellfish produced in our exclusive economic zone have been tending down for decades (see http://www.fishnet-USa.com/After%2035%20years%20of%20NOAA.pdf and http://www.fishnet-USa.com/Research%20funding_A%20win-win.pdf). The people at the American Sportfishing Association (ASA) are embarking on the second year of a campaign to convince anyone who will listen that recreational fishing is equally as or more important than commercial fishing and that in their estimation the federal government should not be putting so much emphasis on managing the commercial fisheries. It began with a press release announcing the completion of an ASA commissioned study by Southwick Associates on May 6 of last year and has progressed to a YouTube video starring gumballs as fish surrogates and with Michael Nussman, the President of the ASA, in a strong supporting role. You might ask what the point of this exercise is. Among other things, “demean” means to lower in standing, and in spite of Nussman’s assurances to the contrary, it sure seems like that’s exactly what the ASA and their Southwick Associates report is attempting to do. If that isn’t an attempt to lower the standing of commercial fishing, particularly when Nussman introduced the report with the words “the current federal saltwater fisheries management system has historically focused the vast majority of its resources on the commercial sector,” it’s hard to imagine what would be. The entire report centers around the idea that expenditures on recreational fishing services, equipment and supplies are somehow equivalent – on a dollar to dollar basis – to dollars generated by commercially caught and landed finfish (The Southwick people disregard commercial shellfish landings, which will be discussed below). In reality commercial fishermen and the people in every other business in the seafood supply chain are dedicated to producing the best possible product at the lowest possible price, as are any business owners engaged in producing products in a free market system. If they weren’t they wouldn’t be in business for very long, because there is a world’s worth of alternative center of the plate proteins competing for the US consumers’ dollars. On the other hand recreational fishermen aren’t buying fish when they go fishing, they are buying a recreational fishing experience, and the more pleasurable that experience is the more they are likely to spend. Within limits this isn’t determined by the amount of fish caught. Recreational fishermen aren’t driven by anything approaching the bottom-line constraints that commercial fishermen and others in the seafood supply chain face. To equate what a recreational fisherman pays to catch a fish to what a commercial fisherman is paid to catch that same fish is to equate the total cost an equestrian pays to ride her horse for a mile to what Amtrak would charge to move her the same distance on a train. Apples and oranges doesn’t come close to describing how unapt the Southwick comparison is, maybe Ferraris and oranges does. In the Southwick report the authors also ignore the value and the economic contributions of the commercial shellfish fisheries (mollusks and crustaceans), stating as their rationale “shellfish are rarely targeted by anglers.” This implies that there is no relationship between commercial shellfish fisheries and commercial or recreational finfish fisheries. The impact that the yellowtail flounder fisheries have on the New England/Mid-Atlantic sea scallop fishery, the most valuable commercial fishery in the US, demonstrates how a seemingly unrelated fishery can have a profound effect on another, and how “dismissing” any of our fisheries, recreational or commercial, can leave naïve readers with severely distorted impressions. The New England/Mid-Atlantic sea scallop fishery is constrained more by the catch of yellowtail flounder, which supports a small recreational fishery in New England, than it is by sea scallop abundance. If the small allocation of yellowtail flounder is inadvertently exceeded by the sea scallop fleet the sea scallop fishery will be closed for a predetermined period in the subsequent fishing year depending on the amount by which the allocation is exceeded. The allocation of yellowtail flounder to the scallop fleet has been on the order of 500 metric tons annually. The sea scallop fishery, the most valuable commercial fishery in the US with landings that have averaged over a half a billion dollars a year in recent years, is dependent on catching just over a million dollars’ worth of these flounder (that have an ex-vessel value of around a dollar a pound). If the yellowtail flounder population declines for any reason the allocation of them to the sea scallop fishery will be reduced proportionally, as will the sea scallop catch. The Gulf of Mexico/South Atlantic shrimp fisheries provide another example of how closely intertwined commercial shellfish fisheries and commercial/recreational finfish fisheries are. Domestic shrimp fisher-men exert a tremendous effort – at a tremendous expense – to avoid bycatch of juvenile stages of important finfish species, particularly snapper and grouper. The Mid-Atlantic/New England squid fishery is managed in large part for the butterfish bycatch (more on butterfish later). And there are similar finfish interactions in other shellfish fisheries. Also, and it’s kind of surprising that the Southwick people ignored this, a small yet significant part of the “commercial” shellfish harvest goes to providing bait to recreational anglers, and the price that they pay for their clams, shrimp, squid and clams tend to be quite a bit higher than what consumers are willing to pay for the same products at the seafood counter. In ignoring the value of the commercial shellfish fisheries the report makes it appear as if fish caught by recreational fishermen add three times as much value to the economy as fish caught by commercial fishermen. The inclusion of all commercially caught fish and shellfish would definitely affect this ratio, meaningless as it is. In fact, well over half of the commercial finfish catch is composed of relatively low value per pound species and virtually all of the commercially caught shellfish are high value per pound. In 2012 the ten most valuable commercial finfish species had an average landed value of less than 26 cents per pound while the ten most valuable shellfish species had an average landed value of over two dollars per pound. No matter what the reasoning, not considering the entire commercial fishery relative to the entire recreational fishery leaves readers with an incomplete and very possibly distorted picture. In every discussion about inequities in recreational fisheries management this seems to be the 800 pound gorilla lurking invisibly in the corner. If you are at all familiar with the current state of fisheries management in the US you know that it’s next to impossible for commercial fishermen to overfish their quota (or TAC or whatever it’s called) in federal waters. Unfortunately that’s not the case with recreational fishermen in recreational fisheries or in those that they share with their commercial colleagues. At this point virtually every commercial fishery that takes place in federal waters is under one form of limited entry or another. What this means is that you need a federal permit to participate in those fisheries. The number of permits allowed in each fishery is limited. Accordingly it takes more than a boat and a desire to participate in a particular fishery to fish. The controls on the limited number of commercial fishermen in a particular fishery can (and usually do) limit where they can fish, when they can fish, how they can fish, the size and horsepower of their boat, the type and amount of gear they can use and the size and amount of the fish they can catch. Depending on the fishery, when a predetermined amount of a particular species is caught the fishery may be shut down. If the amount caught exceeds the commercial quota, as with yellowtail flounder in the sea scallop fishery, the excess amount may be deducted from the following year’s quota. As the chart below (from NOAA/NMFS) shows, the number of saltwater recreational anglers, which remained reasonably stable for the last two decades of the twentieth century, grew significantly in most of the first decade of the twenty-first, until the “Great Recession” began. Whether most of those who left come back to the sport or not, there are and will continue to be millions more than there were a decade ago while the productive capacity of our waters isn’t going to increase significantly. What of what seems to be an underlying theme of Mr. Nussman’s remarks in the press release and in his gumball presentation; the idea that the commercial fisheries are making off with most of the fish and that’s costing the US economy billions of dollars? Coincidentally NOAA/NMFS in the 2012 edition of Fisheries of the United States included a graph titled Top Ten Recreational Species-Harvest Vs. Commercial Harvest reproduced below. With the exception of Atlantic cod and summer flounder, well over half of the harvest of each of the most recreationally sought species nationally are taken by recreational anglers (I’ll note here that the commercial Atlantic cod fishery was historically our most significant commercial fishery since well before the founding of the United States and the summer flounder fishery has been one of the most important commercial fisheries in the Mid-Atlantic for most of the last hundred years). Could it be that Mr. Nussman wants even more of these and other species to meet what from a management perspective appears to be the uncontrollable demands (by managing what an angler can catch per trip but not the number of anglers/number of trips) of the recreational anglers? 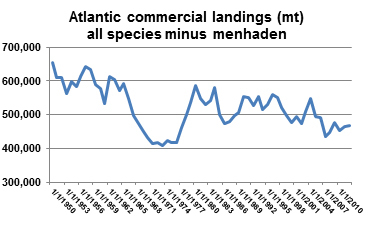 The commercial landings of these ten species and any others that support both recreational and commercial fisheries seem meager indeed, particularly when one considers commercial landings in the US in their entirety. But they certainly aren’t to the fishermen, recreational, party/charter and commercial, who catch them and the businesses they support. And, while Mr. Nussman lumped all commercial finfish fishermen and fisheries together, that is certainly not the real world case. The most valuable commercial fisheries generally involve large companies, big boats, a lot of onshore or onboard processing and a lot of capital. The smaller ones generally don’t, and in them are the fishermen who would suffer the greatest harm from any reallocation. They are also the fishermen who have been the bedrock of our fishing communities from Maine to Alaska and beyond, and as we’re already seeing, as we lose them we lose those communities as well. The final chart, again from NOAA/NMFS, shows how the number of fish taken home by saltwater anglers each year has declined to less than half of what it was in the 1980s. While I’m in no way expert on the saltwater recreational angling industry, this seems to be a pretty unsustainable trend, but does its continuation have to be inevitable? No more inevitable than the constant whittling down of commercial and recreational quotas are. Is there a solution to what I’ll call the saltwater recreational anglers’ dilemma? Every year more commercial fishermen and the people in fishing dependent businesses are realizing that better science almost always means more fish – and when it doesn’t we definitely don’t want to be catching too many. As long as the precautionary principle is applied only to protect the fish and not to protect fishing communities and is rigidly controlling fisheries management decisions, what we don’t know about fish stocks is going to hurt us. Some of us have come to terms with this and are committing to collaboration with researchers ashore and on the water. One of the most recent positive results of this was announced by the Mid-Atlantic Council last week, reporting that a just completed stock assessment determined that butterfish were presently not overfished and hadn’t been for at least twenty-three years. This assessment was the result of several years of cooperation and collaboration between the Council staff, researchers at the Northeast Fisheries Science Center and several universities, fishermen and their representatives. It wasn’t easy, but it’s getting easier, and the reward is going to be larger – but sustainable – harvests of both butterfish and squid. And it didn’t involve any fishermen trying to grab quota from any other fisherman. All it involved was getting the science closer to right. A recent NOAA/NMFS publication (Fish Assessment Report – Fiscal Year 2014 Quarter 2 Update available at http://www.st.nmfs.noaa.gov/Assets/stock/documents/report/FY14Q1_AsmtReport_Summary.pdf) reported that only 59.6% of the fish stocks listed on that agency’s Fish Stock Sustainability index had “adequate” assessments (from NOAA/NMFS “generally a minimally adequate assessment can be con-ducted where there is good information on the level of annual catch and an indicator of the degree of change in stock abundance over time”). Over 40% of our important fish stocks do not. What that means is that, because of the precautionary principle the harvest of almost half of our important fish stocks are too low because we don’t know enough about them because the science isn’t there to adequately assess them. There’s definitely a message in there for Mr. Nussman and his members. And it wouldn’t require gumballs to illustrate it. I would be remiss if I didn’t finish this with a reminder that we are importing on the order of 90% of the seafood we consume in the U.S. and fresh, locally produced fish is getting harder and harder to find and increasingly expensive. There are more fish out there. We need to find or force the funding to provide our scientists and our managers with the science necessary to adequately manage our fisheries. That would be good for everyone, not just the recreational fishermen, the commercial fishermen or the party/charter fishermen. The Providence Business News gets it right! John Lee, a reporter for The Providence Business News, tackles the potentially complex and confusing subject of the impact of increasing ocean temps on fisheries and fisheries management. His article starts out “Fishery management traditionally has focused on fishing pressure, the removal of animals from a population with nets, lines and traps, as the only statistic worth using in the regulatory equation. The rationale is simple, at least in theory: If the landings in a fishery drop, it’s assumed that the population has declined.Everything else that might change a fish stock – all the environmental, ecological or climatic variables that are virtually impossible to quantify with any accuracy – have been addressed as statistical constants in fish-population models.But climate change and its rapid effect on fisheries are forcing scientists and policymakers to rethink the traditional management approach. Suddenly, every fixed point in the equation has to be reconsidered as a network of moving parts.” From there he gets into ecosystem based management and the reactions of both managers and fishermen. and for the layperson is well worth reading, covering territory that is never explored by the blame-it-all-on-fishing claque. The debate raging within the conservation community over “new conservation” appears to be essentially a religious war, with doctrinal beliefs well defined and the rancor and defamation appearing to grow each month. In essence, the “new conservation” argues that the major gains in biodiversity protection will be made in human-used environments and by working with communities and industries that use these environments rather than by the use of protected areas (Kareiva and Marvier 2012). The actual rancor seems to stem more from a philosophical question of whether biodiversity should be conserved for its own sake or because it is valued by humans (Soule 2013) and from criticism of some of the icons of the conservation movement in other writings by Kareiva (Karevia et al. 2011). These debates need to be set aside and the energy of the conservation community needs to be focused on what will work best to protect biodiversity. Marine conservation, where little energy has been expended until the last few decades, represents the new frontier of conservation. Marine biodiversity is under threat from a range of factors, but I would like to focus on the impacts of fishing on biodiversity, and specifically overfishing of marine species and communities and associated ecosystem changes, mortality of non-target species, and the impacts of fishing gear on habitat. Fishing by its nature reduces the abundance of target species, changes the age- and size structure, and can change the trophic structure of marine ecosystems. Non-target species are commonly caught and killed by fishing gear, and this is of particular concern when endangered species or protected species such as turtles, marine mammals and marine birds are concerned. Mobile bottom-contact fishing gear (trawls and dredges) can dramatically modify bottom habitats. Initiatives using the “old conservation” of protected areas have been hard at work. It is estimated that marine NGOs funded through U.S. foundations and their own fund raising spend on the order of $300 million per year on marine conservation (California Environmental Associates 2012), with much of that funding directed towards protected areas advocacy. These efforts have led to major successes both in international acceptance of targets for protected areas (the International Convention on Biological Diversity CBD has an agreed target of 10% of the oceans in no-take areas by 2020) and in getting areas protected. Protected area advocates have been particularly successful in the United States and Australia, where large areas of the ocean have been given protection from fishing. The “new conservation” has been equally active in the marine space, some of it funded by the same NGOs and foundations. Perhaps most prominent has been the move to seafood certification. The Marine Stewardship Council, an independent NGO initiated by a partnership between industry (Unilever) and an NGO (WWF), has worked with retailers, governments and industry groups to set standards, certify fisheries as well managed and help fisheries move towards meeting the standards. Many retailers have made commitments to sell only certified seafood within the next few years, and the number of certification schemes is proliferating. Seafood certification is a classic example of the “new conservation” in that partnerships with industry and the conservation movement are altering the behavior of the fishing industry and leading to better biodiversity protection (Gutierrez et al. 2012). Perhaps the most striking successes of the “new conservation” have been in the reduction of by-catch of threatened or protected species. Because of political pressures and legal requirements to reduce such by-catch, fishing industries have reduced by-catch of dolphins in the eastern tropical Pacific tuna fisheries by 99% (Hall et al. 2000); reduced the by-catch of sea birds in Antarctic longline fisheries by 99% (Cox et al. 2007); the by-catch of turtles in the Hawaii longline fishery by 95% (Moore et al. 2009); and the by-catch of turtles in the SE shrimp trawl fisheries by 94% (Finkbeiner et al. 2011). Closed areas are a very blunt and not very effective instrument to protect the biodiversity from this kind of by-catch, although closed areas have generally been part of the package. A recent review of by-catch mitigation for three species including a turtle, an albatross and a small cetacean (Senko et al. 2013) concluded: “Time–area closures appeared to be of limited effectiveness for the focal species.” Many have argued for closing biodiversity hot-spots (Worm et al. 2003). But since many of the species of concern are highly mobile, closed areas will have the effect of intensifying fishing effort elsewhere with little real reduction in mortality of these species. But mixed-species fisheries may catch dozens of species in one set of the net, and the sustainable exploitation rate may differ greatly between species. So how to harvest the most productive species and avoid the least productive ones? “Old conservation” strategies would close the areas where the most vulnerable species are typically found; the new conservation provides incentives to fishing vessels to find areas where the target species can be caught and the vulnerable species can be avoided. These latter approaches have been shown to be highly effective when applied (Branch and Hilborn 2008) and are in fact much more effective at reducing the catch of vulnerable species than closed-area strategies. On the west coast of North America, by-catch limits for a range of species including marine birds, Pacific salmon and Pacific halibut have the potential to close highly valuable fisheries. So fishing industry groups have formed voluntary cooperatives that adopt legally binding agreements on when, where and how to fish, with the only role of government to set total catch limits (DeAlessi et al. 2014). Protected areas would never be able to achieve this kind of control as it requires day-to-day monitoring of catch and small-area closures that are not permanent. And while protected areas seem to be an ideal solution for keeping sensitive habitats from the ravages of bottom-contact gear, the data suggest that “new conservation” may be a more effective tool for even this problem. For instance, the British Columbia continental shelf is subject to a bottom trawl fishery that tends to fish soft grounds that are not particularly sensitive. The ocean floor there is a patchwork of hard and soft areas, with corals and other sensitive structures scattered at various places along the coast. Any protected areas approach would require a highly detailed map (which does not exist) of these sensitive features and a very complex patchwork of closed areas. What does exist, however, is an agreement negotiated between local environmental groups and the British Columbian fishing industry that includes specific closed areas; individual vessel limits on the allowable catch of corals and sponges that provide incentives for fishermen to avoid any place these might be caught; a reporting requirement to broadcast immediately any large catch of corals and sponges to the entire fleet so that these sensitive spots are identified and known; and a consultative process between government, NGOs and industry to monitor and revise these methods. Longline hooks used to catch black cod and halibut in the Gulf of Alaska. The protected-area approach in marine conservation has two major disadvantages. The first problem is effort displacement. When an area is closed to fishing, the vessels move elsewhere, adding fishing pressure to some areas that potentially equals or outweighs the benefits seen in the protected areas (Pastoors et al. 2000). Hamilton et al. (2010) found that abundance of target species declined outside reserves and increased inside reserves, yielding no net increase in abundance. The second biodiversity problem is a reduction in the total sustainable yield of fish stocks when marine reserves are large. This loss will almost certainly be made up by some other form of food production with negative biodiversity consequences (Hilborn 2013). At the extreme, if lost fish production is compensated by cutting rainforest to grow crops or cattle, we can be very sure that the total biodiversity consequences will be negative. Everyone in the conservation movement is interested in protecting and ideally expanding global biodiversity. Protected areas and cooperative arrangements with extractive users are just two of a range of tools available to achieve this goal. We should focus on how best to achieve biodiversity gains and stop the pointless philosophical debates. I thank Martin Hall and Ed Melvin for providing some of the examples and general guidance in the area of by-catch avoidance. Branch, T. A. and R. Hilborn. 2008. Matching catches to quotas in a multispecies trawl fishery: targeting and avoidance behavior under individual transferable quotas. Canadian Journal of Fisheries and Aquatic Sciences 68:1435-1446. California Environmental Associates. 2012. Design for Sustainable Fisheries. Cox, T. A., R. L. Lewison, R. Zydelis, L. B. Crowder, C. Safina, and A. J. Read. 2007. Comparing effectiveness of experimental and implemented bycatch reduction measures: The ideal and the real. Conservation Biology 21:1155-1164. DeAlessi, M., J. M. Sullivan, and R. Hilborn. 2014. The legal, regulatory, and institutional evolution of fishing cooperatives in Alaska and the West Coast of the United States. Marine Policy 43:217-225. Finkbeiner, E. M., B. P. Wallace, J. E. Moore, R. L. Lewison, L. B. Crowder, and A. J. Read. 2011. Cumulative estimates of sea turtle bycatch and mortality in USA fisheries between 1990 and 2007. Biological Conservation 144:2719-2727. Gutierrez, N. L., S. R. Valencia, T. A. Branch, D. J. Agnew, J. K. Baum, P. L. Bianchi, J. Cornejo-Donoso, C. Costello, O. Defeo, T. E. Essington, R. Hilborn, D. D. Hoggarth, A. E. Larsen, C. Ninnes, K. Sainsbury, R. L. Selden, S. Sistla, A. D. M. Smith, A. Stern-Pirlot, S. J. Teck, J. T. Thorson, and N. E. Williams. 2012. Eco-Label Conveys Reliable Information on Fish Stock Health to Seafood Consumers. PLOS One 7. Hall, M. A., D. L. Alverson, and K. I. Metuzals. 2000. By-catch: Problems and solutions. Marine Pollution Bulletin 41:204-219. Hamilton, S. L., J. E. Caselle, D. P. Malone, and M. H. Carr. 2010. Incorporating biogeography into evaluations of the Channel Islands marine reserve network. Proceedings of the National Academy of Sciences of the United States of America 107:18272-18277. Hilborn, R. 2013. Environmental cost of conservation victories. Proceedings of the National Academy of Sciences of the United States of America 110:9187-9187. Kareiva, P., R. Lalasz, and M. Marvier. 2011. Conservation in the anthropocene: beyond solitutude and fragility.in M. Shellenberger and T. Nordhaus, editors. Love your monster: Postenvironmentalism and the anthropocene. Breakthrough Institute. Kareiva, P. and M. Marvier. 2012. What Is Conservation Science? BioScience 62:962-969. Moore, J. E., B. R. Wallace, R. L. Lewison, R. Zydelis, T. M. Cox, and L. B. Crowder. 2009. A review of marine mammal, sea turtle and seabird bycatch in USA fisheries and the role of policy in shaping management. Marine Policy 33:435-451. Pastoors, M. A., A. D. Rijnsdorp, and F. A. Van Beek. 2000. Effects of a partially closed area in the North Sea (“plaice box”) on stock development of plaice. Ices Journal of Marine Science 57:1014-1022. Senko, J., E. R. White, S. S. Heppell, and L. R. Gerber. 2013. Comparing bycatch mitigation strategies for vulnerable marine megafauna. Animal Conservation published in early on-line May 2013 DOI: 10.1111/acv.12051. Soule, M. E. 2013. The “New Conservation.” Conservation Biology 27:895-897. Worm, B., H. K. Lotze, and R. A. Myers. 2003. Predator diversity hotspots in the blue ocean. Proceedings of the National Academy of Sciences of the United States of America 100:9884-9888. March 31, 2014. The views expressed above are the author’s and should not be taken as those of SNAP or its member organizations. For a different way of looking at fisheries management…. I have written before about the shortcomings of the “blame it all on fishing” underpinnings of our management system (See Overfished or depleted? at http://fisheries.org/blogs/?p=5). Israeli fisheries consultant Menakhem Ben-Yami has recently published two articles on this subject, A word of warning: West – not always the best (at http://tinyurl.com/MB-Y-Part-1) and How to manage fisheries without replicating Western follies (at http://tinyurl.com/MB-Y-Part-2), in Infofish International. Infofish, originally created by the United Nations’ Food and Agriculture Organization in 1981, “since 1987, it is an Intergovernmental Organization providing marketing information and technical advisory services to the fishery industry of the Asia-Pacific region and beyond from its headquarters in Kuala Lumpur, Malaysia. Fourteen countries are currently members of INFOFISH which are Bangladesh, Cambodia, India, Iran, Malaysia, Maldives, Sri Lanka, Pakistan, Philippines, Papua New Guinea, Solomon Islands and Thailand” (from the Infofish Iternational website at http://www.infofish.org/Aboutus.aspx). For another perspective on how fisheries should be managed I strongly recommend both articles. I just started doing a column for The Online Fisherman, an up and coming recreational fishing website which is primarily focused on Florida. The people there contacted me about doing a regular column and I quickly agreed. While you might not know it by the actions of some, recreational and commercial fishermen have much more in common than not, and among the things they share are impediments put in place because of inadequate science (note that I don’t meant to imply inadequate scientists), overzealous “conservationists,” and far too many people and organizations willing to pit one sector of fishermen against another to further their own self-serving agendas. The purpose of the column is to shed light on some of these impediments, to demonstrate that there are more effective ways of increasing one sector’s harvest than by taking it from another sector. The first column is Better Science Means More Fish and it’s available at http://www.theonlinefisherman.com/reel-news/item/better-science-means-more-fish. “The present day environmental fisheries lobby, a once radical fringe movement, has suddenly sunk their claws firmly into mainstream European politics. They show no signs of moving. Once a well-intentioned operation, it has become a confused and misguided witch-hunt, condemning fishing industry leaders and politicians, armed only with ecopropaganda and anti-science policies. Only 58 of the 766 total MEPs are members of the Green grouping. So how and why, are we allowing the Green lobby to dictate our fisheries policy? I strongly suggest that you follow the link, read her column and consider how the situation as she sees it on the “other side” compares to what’s been going on over here. I admit I used to be prejudiced towards gillnet fisheries. I used to believe that all gillnet fisheries should be shut down, period. In my defense, all I knew of gillnets were the injuries that they can cause. During my time as a volunteer for the Santa Barbara Marine Mammal Center from 2007-2011, I personally rescued over 20 sea lions with gillnet entanglements. Although 100% of these animals were eventually released alive, the sights and smells of those injuries throughout the rehabilitation process still haunt me to this day. I didn’t understand why gillnet fisheries still existed and I was hungry to learn more. And thus began my incredibly humbling journey to learn more about California’s set and drift gillnet fisheries which target swordfish, thresher sharks, halibut and white seabass. I’m telling my story for a couple reasons. First because I know a lot of folks share my intense passion and genuine intention to help preserve our world’s oceans, but like me are not very sure where and how to start. I want to share some lessons I learned the hard way in an effort to prevent you from wasting your time. I’m also writing this because I think it’s scary how easy it is for someone that knows very little about shark fisheries to be considered an “expert” on the subject with the power to influence other like-minded conservationists. And finally, I want to show how it’s possible (and quite necessary) for shark conservationists to understand and support responsible shark fishing. This is contrary to popular belief for most so if you disagree I urge you to read on. The only problem is that my story is so complicated that I split it into two parts so please stay with me. The blogger is Jonathan Gonzalez, a graphic designer with a solid and obvious commitment to ocean conservation. What separates him from the crowd, and what brought his blog to my attention, was his unwillingness to accept at face value the myriad of commonly held “truths” of marine conservation and his willingness to devote himself to researching what’s really going on in our oceans and in our fisheries. The chef asked me, “So you say I can’t serve this thresher shark meat because it’s not sustainable, but you say it’s OK to serve this halibut that was caught it the same net as the sharks? I don’t get it.” I didn’t get it either. I don’t remember what I told the chef after that, but I said enough for him to remove local thresher shark from his menu. What I do remember is walking away feeling very dirty. For the first time I asked myself, “What the hell am I doing?” “ How did I get here?” “Am I really doing the right thing?” This gut check was another life-changing moment. I can’t recommend too highly his blog or his personal website, Organic Creativity, at http://www.organiccreativity.com/html/contact.htm. His description of the learning process he went through is invaluable and should be mandatory reading for anyone who has bought hook, line and sinker into marine conservation campaigns without considering their human impacts or the degree to which they are based on facts. Read what Nils E. Stolpe, Steve Cadrin, John Everett, Ray Hilborn, Molly Lutcavage, Bonnie McCay, Brian Rothschild, James Sulikowski, and Vidar Wespestad have to say about overfishing. The Magnuson-Stevens Act (“MSA” or “Act”) is up for reauthorization in 2014 and the opportunity to fix what is broken and improve what has not worked well should not be missed. At many governmental hearings and public meetings, it is said that all we need to improve the MSA is “flexibility.” Words like “flexibility” mean different things to different people, and such a cursory debate will not produce a functioning law for the complex issues that we face in this early part of the 21st Century. While various interests may recommend different means of improvement, there is widespread agreement that in certain key areas, the MSA as interpreted and implemented falls short of our Nation’s needs. These key areas include an inability to develop accurate and timely science regarding both fish and people and to use that science to benefit both when and where it is needed. In this paper, which is intended as an introduction of a series examining in more detail suggested modifications to the MSA, major issues are laid out. Identification of the major issues are from working in the field of fisheries management science and from hearing over time the concerns of fishermen, fisheries scientists, community leaders, lawyers, and many others. This can be done by focusing on two main principles. First, the MSA’s language must be rewritten to strengthen the scientific basis for all conservation and management measures, including not only the biological (fishery related), but the much neglected socio-economic (people related) sciences. Second, balancing all ten National Standards to reflect an appropriate symbiotic focus, rather than a focus that has narrowed over the years to a preoccupation with only one concern: “overfishing.” Rewriting the National Standards to ensure these goals are consistent with the intent of the MSA and its predecessor legislation and has the potential to bring greater balance and scientific justification to fisheries management. Mere reauthorization without thoughtful changes to achieve these goals will fail to achieve balance in fisheries management and endanger the sustainment of our Nation’s fisheries resources. Thoughtful change requires that the MSA be rewritten.